Parents, skip the line at Back to School time! You may pre-register your child for the 2019/20 school year at your child's Extended Day site May 1st thru May 17th on Tuesdays, Wednesdays, and Thursdays only. Times are from 6:30 a.m. until school begins, and from school dismissal until 6:00 p.m.
Pre-registration will also be on July 9th and July 23rd from 8 - 5:30 p.m. at the Extended Day administrative office located at 1014 S.W. 7th Road in Ocala. Space is limited, so don't delay. For more information, contact the Administrative office at 352-671-4135. 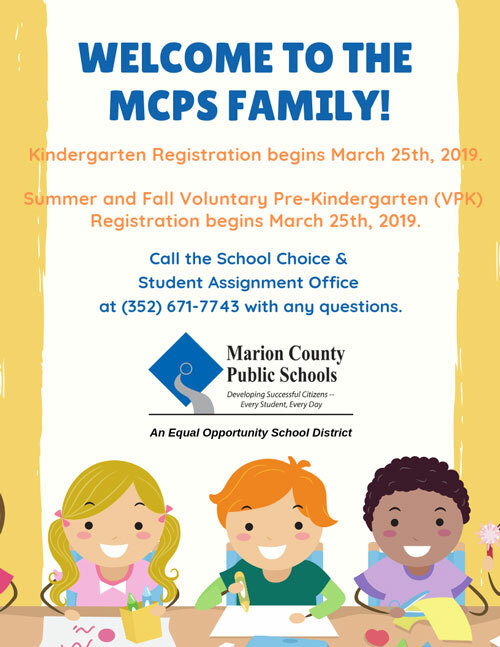 The Extended Day Program of Marion County Public School’s provides before and/or after school childcare services at thirty-eight school sites throughout Marion County. Approximately 3,000 students per day participate in this program. The morning programs are open as early as 6:30 a.m. until school starts and the afternoon programs open at school dismissal until 6:00 p.m. The program is available every day school is in session, including early release days. This is a flat rate, fee-based program. Parents/Guardians must pre-register their children. For more information about the Extended Day Program, please click on one of the links to the below or call the Extended Day Office at (352) 671-4135. Programming enrichment opportunities include: the Discovery Science Center, 4H, The Humane Society, Feed the Need Gardening Program, and various programming activities such as wellness, sewing, science, arts, cooking projects, outdoor sports, Spanish, and more.